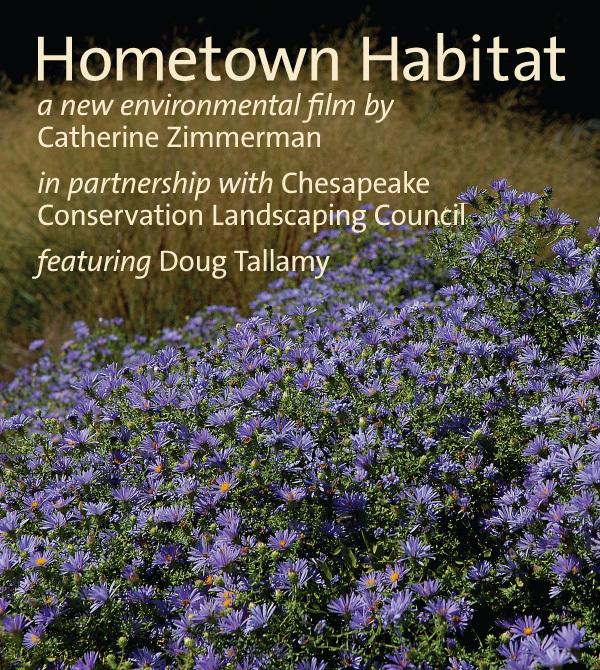 Catherine Zimmerman (The Meadow Project) has teamed up with Doug Tallamy, PhD and the Chesapeake Conservation Landscaping Council to produce a new film on native plants called Hometown Habitat! The Meadow Project and CCLC missions’ promote the principles of conservation landscaping and expand the practice of conservation landscaping throughout the Chesapeake Bay region. Our hope is that the production of Hometown Habitat will further expand our missions beyond the Chesapeake Bay, to the entire country! Hometown Habitat is a 90-minute environmental, education documentary focused on showing how and why native plants are critical to the survival and vitality of local ecosystems. Entomologist Doug Tallamy, whose research, books and lectures, on the misuse of non-native plants in landscaping, sound the alarm about habitat and species loss provides the narrative thread throughout Hometown Habitat. The message: “We can change the notion that humans are here and nature is some place else. It doesn’t have to, and shouldn’t be that way.” Each individual has the power to conserve resources, restore habitat for wildlife and bring beauty to their patch of earth. Donating funds to make this documentary film possible was the right thing to do. It’s important work, and what better way to convey the message about native plants, pollinators and larval foods than by seeing the relationship first hand. Surely, if a picture is worth a thousand words, then a movie is worth a million. Award winning director, Catherine Zimmerman, and film crew journey across the country to visit Hometown Habitat Heroes, people – young and old of various races and creeds – who are reversing detrimental impacts on the land and in the water of major U.S. watersheds, one garden at a time. They wind their way through the watersheds of Florida, the prairies of the Mississippi River Basin, the streams and rivers of the Rocky Mountains, the Chesapeake Bay, the Great Lakes and Columbia River to share success stories and works-in-progress that celebrate conservation landscaping that re-awakens and redefines our relationship with Nature. Along with the everyday Hometown Heroes, we meet ecologists, entomologists and other experts who will share the science behind how today’s ‘native-plants-know-best’ enthusiasts, landscape architects and conservation groups are helping 20th century-minded city planners, businesses and developers appreciate the myriad 21st century benefits of low-maintenance, seasonally-dynamic and eco-healthy landscape installations, that respect Nature’s original best practices. Native Plants & Wildlife Gardens: Let’s Bring It Home! Thanksgiving is nearly upon us and the Hometown Habitat team is so thankful for our followers and supporters! Educating people to include native plants in their landscapes is our mission. Hometown Habitat is a big project and as independent filmmakers, we simply can’t make this film without raising money for the production costs. 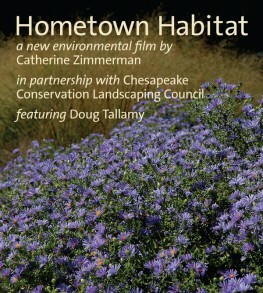 Please join our team and make a tax-deductible contribution at chesapeakelandscape.org/hometown-habitat. We need you! Each of the stories we are traveling to tell highlights people or organizations who are using native plants to heal and return balance and diversity to ecosystems in their hometowns. We call them Habitat Heroes. Take a look at some of those Heroes! Contact: info@hometownhabitat.com for screening license rates. We Need Your Help To Produce & Promote This Film! By making this film, we want to reach beyond those currently working on habitat restoration. We hope to inspire a new army of habitat heroes across the nation! Be part of this effort! You can donate to the film at hometownhabitat.com.